Mordechai Anielewicz (1919-1943) was born near Warsaw to a traditional Polish-Jewish family. After completing Hebrew school, he joined the Betar Zionist youth movement, and later Hashomer Hatzair Zionist youth movement. Shortly before the outbreak of World War II, Anielewicz participated in a Polish military training camp. When Germany invaded Poland, he joined a group of youths who fled east in the hopes of organizing an armed resistance. However, the Soviets invaded the eastern half of Poland, and Anielewicz was eventually arrested and thrown in jail for helping Jewish refugees flee across Romania to Israel. Released from prison shortly after, Anielewicz returned to Warsaw and began organizing a resistance movement. He started a secret newspaper called Neged HaZerem, “Against the Current”. By the end of 1940, Anielewicz was among 400,000 Jews (a third of Warsaw’s total population) forcibly crammed and imprisoned inside the tiny Warsaw Ghetto. Less than a year later, the Nazis started “evacuating” Jews from the Ghetto and when Anielewicz heard reports of mass murder, he called up his resistance fighters. The group attempted to join the Polish underground resistance, but was rebuffed. They risked their lives trying to smuggle and build up a weapons arsenal inside the Ghetto. By September 1942, three quarters of the Warsaw Ghetto’s Jews were deported, and 265,000 of them murdered. Anielewicz and his team started building bunkers and tunnels, and stockpiling their homemade grenades and Molotov cocktails. Shortly after, they were able to acquire several rifles and mines, and one machine gun from the Polish underground. They staged their first attack in January of 1943, and managed to free a handful of Jews. This convinced the Polish underground that the Jews could fight, and they smuggled more weapons to the group (with help from the Jewish Military Union, made up of former officers in the Polish army) now calling itself the Jewish Combat Organization. The resistance continued to make serious trouble for the Nazis. 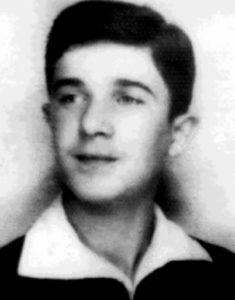 When word came that the Warsaw Ghetto would soon be liquidated, Anielewicz wrote a letter to all of its residents to join the fight, writing that “We are slaves, and when slaves are no longer profitable, they are killed.” The Nazis began the final deportation on April 19, the morning before Passover. They sent in 821 SS troops, who were met by 750 Jewish fighters under the command of Anielewicz. The Jews inflicted serious damage, and the Nazis retreated. They returned with over 2000 soldiers and heavier weapons. 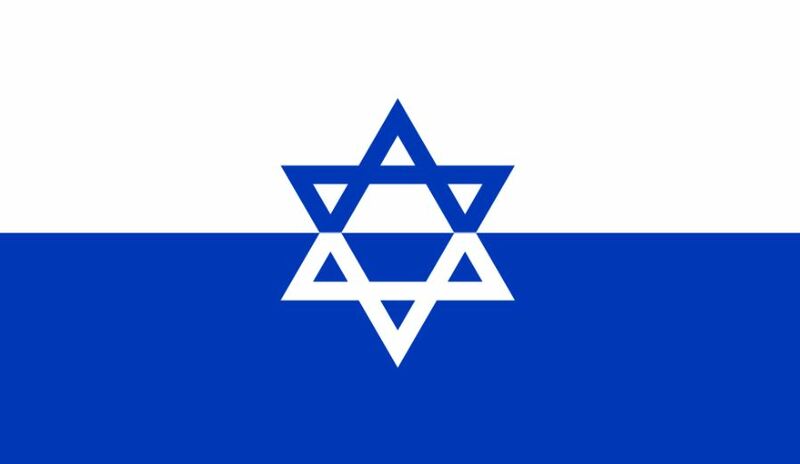 The Jewish resistance had the upper hand for nearly a week – and at one point even raised up their flag – but were eventually overpowered. More than 56,000 Jews were captured. The Nazis continued to search for bunkers and slaughter anyone hiding inside. They reached the command bunk on Mila Street on May 7th, where nearly three hundred Jews, including Anielewicz, were shot to death, died by suffocation from gas grenades, or committed suicide. The surviving fighters continued to resist until May 16. While the vast majority of Jews perished, a handful of survivors known as the “Ghetto Fighters” later settled in Israel and established a kibbutz. The actions of Anielewicz gave Jews a sense of hope and strength. He inspired countless others both in his day, and in the present day, and became a symbol of bravery and self-sacrifice. The Polish Army posthumously awarded Anielewicz the Cross of Valour and the Cross of Grunwald. This year, the eve of Passover is once again on April 19, as it was in 1943 when Anielewicz and his courageous warriors launched the Warsaw Ghetto Uprising. Passover Begins Tomorrow Night – Chag Kasher v’Sameach! Regarding the custom of opening the door for Eliyahu on Passover night – don’t think Eliyahu really enters through the physical door of your house. Instead he enters through the doors of your heart and mind. This entry was posted in Extraordinary Individuals, Law, Politics & Military and tagged Betar, Ghetto Fighters, HaShomer HaTzair, Holocaust, Jewish Combat Organization, Mila Street, Polish Jews, Warsaw Ghetto, Warsaw Ghetto Uprising, World War II, Zionist on April 18, 2019 by Jew of the Week. Mathilde Galland (1926-2018) was born in Italy to Christian parents of Swiss and Italian heritage. While studying in medical school at the University of Geneva, she met an Israeli and converted to Judaism to marry him. She became passionate about her new faith, and the Zionist dream, working tirelessly to help Israeli fighters (especially the Irgun) acquire weapons and funds. After receiving her PhD in biology in 1953, the young family settled in Israel, and Mathilde became a researcher at the Weizmann Institute. During this time, she made important discoveries about viruses and cancer, and was part of the team that first developed a way to determine the gender of an embryo. Mathilde moved to New York after getting divorced, and joined a research team at Cornell University. During this time, she met Arthur B. Krim (1910-1994), the son of Russian-Jewish immigrants. Krim graduated from Columbia Law School in 1932 at the top of his class, and worked at a law firm until the outbreak of World War II. He served for the War Department doing critical military work, attaining the rank of lieutenant colonel. After the war, Krim launched a film studio start-up, Eagle-Lion Films. When it tanked, he became a manager at United Artists, and was given three years to turn a profit. He did it in six months, and went on to head United Artists for over two decades (producing hit films like Dr. No, which brought James Bond to America, and West Side Story, which won a record 10 Oscars). 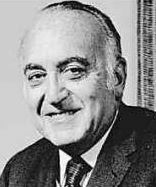 Krim and his partners made United Artists the largest movie producer in the world by 1967. Krim would later co-found Orion Pictures (Amadeus, Dances with Wolves). 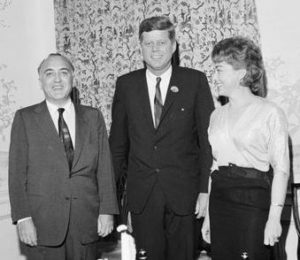 All in all, Krim was a film studio exec for 46 years – possibly the longest in Hollywood history – produced and distributed over 1000 films, and was called “the smartest man ever to work in the movie industry.” Aside from movies, Krim was an important member of the Democratic Party, and served as its finance chairman. He was a personal advisor to three presidents: Kennedy, Johnson, and Carter. Mathilde and Arthur Krim were famous for their extensive philanthropy and the huge role they played in the civil rights movement, as well as in ending apartheid in South Africa and Zimbabwe, and advancing human rights all over the world. Mathilde continued to work as a researcher throughout her life, and ran the interferon lab at Sloan-Kettering Institute for Cancer Research between 1981 and 1985. 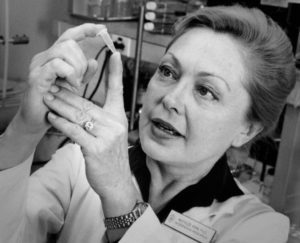 During this time, she was one of the first to identify the grave dangers of HIV-AIDS, and did important research to understand the pathology of the disease. In 1983, she founded the AIDS Medical Foundation, and then co-founded the American Foundation for AIDS Research. Aside from her own research work, the Krims donated millions of dollars to the cause. In addition to 16 honourary doctorates, she was awarded the Presidential Medal of Freedom in 2000, the highest civilian honour in America. Her husband had previously received the Presidential Medal of Freedom in 1969. Every Hebrew should look upon his Faith as a temple extending over every land to prove the immutability of God and the unity of His purposes. This entry was posted in Arts & Entertainment, Business & Finance, Law, Politics & Military, Science & Technology and tagged AIDS, American Foundation for AIDS Research, American Jews, Apartheid, Civil Rights Movement, Columbia University, Convert, Cornell, Democratic Party, Eagle-Lion Films, HIV, Human Rights, Irgun, Italian Jews, John F. Kennedy, Lyndon B. Johnson, Orion Pictures, Philanthropists, Presidential Medal of Freedom, Russian Jews, Social Justice, Swiss Jews, United Artists, US Army, Weizmann Institute, World War II, Zionist on April 10, 2019 by Jew of the Week.